Any out there know what this could mean? So a friend asked me to look over his ColecoVision cause it stopped working correctly. Thoughts on what I should trouble shoot here from the picture and the fact there is no sound? Carts have been cleaned and worked in another system so really not sure where to go with this now. Suggestions are surely welcome here. The beginning of the end of the power suppy. My first guess would be dirty carts but as you said they're clean. I know cleaning them really well can be rather difficult without actually opening cart which unfortunately damages label. Maybe try a brand new or newer homebrew cart that you know is clean and working. Old carts can just go bad from improper storage conditions even if the game was otherwise carefully handled or looks to be in excellent external condition. But as you said the carts work another system. Perhaps the console's contacts are what's dirty and cleaning those may help but that would be tricky to do thoroughly without opening the casing. Does game start or does it stay on title screen? If it does start is there sound? Does it seem to control OK albeit with garbled video output? Does anything happen if you gently rotate the connected RF out cable? Possibly cleaning RF cable contact points may be an easy fix. Are you using correct AC adapter? Probably so because any other AC adapters wouldn't even fit back of console. But perhaps AC adapter is bad. Or as AtariBuff said it's the power supply itself at the back of console that is going bad. If so, and unless there is a compatible aftermarket part (which I doubt), the console may end up becoming nothing more than a paperweight without sacrificing a working power supply from a donor console thus making the donor the paperweight. A compromise would be to trash the broken interior or salvage for parts and salvage the exterior assuming it is in good shape. Sometimes a broken exterior and a broken interior can be combined into a working great looking console that is one in the trash heap is better than two in the trash heap and no working console. Otherwise it may be an internal issue such as loose solder joints or actual bad components. Maybe start with the video output and trace from there looking for any bad spots that may need cleaning or soldering. Sorry if obvious questions or suggestions but I'm no expert so I'm just offering my 2 cents. I actually bought a working backup ColecoVision just in case my primary one fails. These things are 35 years old and even if cared for they can abruptly break. And between failed units getting thrown in garbage and collectors buying up the rest I figure working units will become more scarce and more expensive; especially if aesthetic appearance is a factor. The reality is there were only 2 million units sold as compared to the 10's of millions of other more popular consoles. I wish I knew how to fix electronics but I barely can solder myself. Hopefully that helps to at least diagnose the problem if not fix it but if not hopefully some people with more expertise can assist more. Sort of unrelated but every ColecoVision owner should have 9-pin extension cables connected to their controller ports. This way there's plenty of slack as to not pull on controller ports not to mention extra length to sit away from console comfortably. Also it allows for the swapping of other 9-pin controllers and expansion module accessories without any wear and tear on the actual controller ports. Good stuff to try here. I just didn't want to use lots of time chasing ghosts here. I did find a power supply video so I might check the connectors quick as that would be easy to do I think. Maybe find a clean Coleco game as well just in case but I tried lots of carts and they all had the same issue. They boot with errors. No sound but are playable to a point. At some point or another the bugginess just makes it unplayable again. Cleaning the cart slot was another thought. Just not sure how to get that really cleaned. I don't think the envelope with alcohol will work here but the pins don't look too corroded but then again I can't see to the bottom of them either. Thoughts on this would be nice. Being its soldered to the board its not something easily removed for better cleaning and all. I will give both those a spin and see what happens. If you have any way to do it (possibly have Atarimax Ultimate SD cart? ), try running memory diagnostics. - Loose connection where the Power Supply connects to the CV. Try wiggling the connector with the system on and press Reset as you do to see if the CV Bios screen changes. - Bad RAM chip(s). Download the CV Technical/Repair Manual and compare screen examples to what you got... ann.hollowdreams.com has the manual for download. Largest Cartridge size on Coleco without Super Game Module? Mappers? 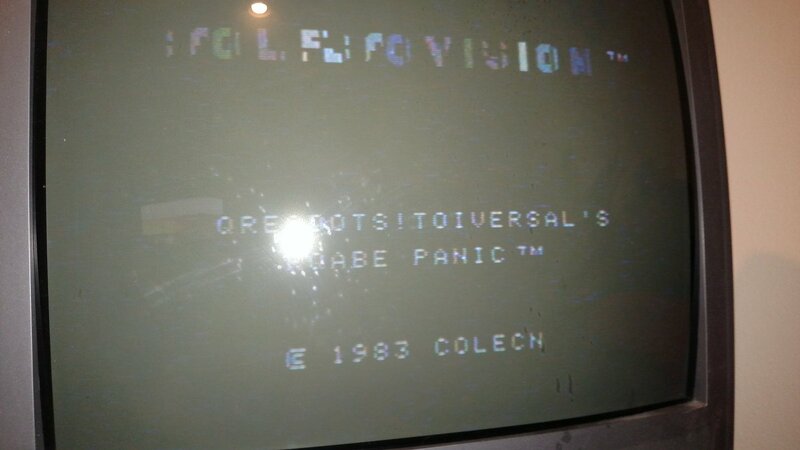 Diagnostic codes for the Colecovision?